A lot of exciting news today surrounding the Mega Man Legends 3 Project. 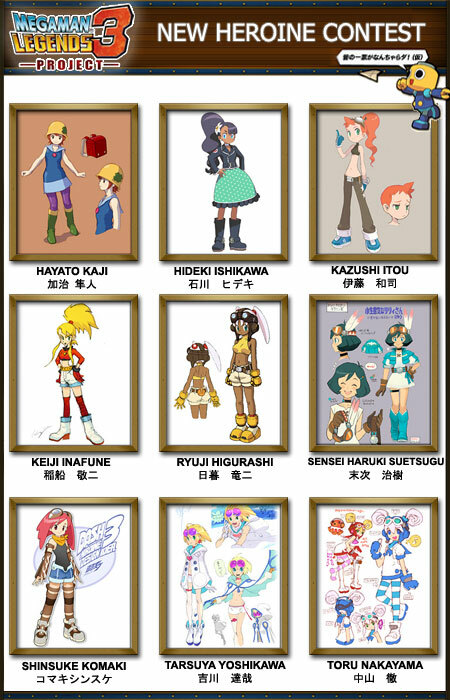 Their first fan-interaction poll is up, where fans can vote on which design will be utilized for their new female character, tentatively called “Lilly.” Nine experienced Rockman series artists each submitted a design utilizing an official character biography from the DASH3 planning team as a reference. Who is this Lilly? *Her final name will be determined after the design is selected. Seeking excitement, she hangs out with ________ and has become something of a team idol. Her rather stubborn attitude contrasts with her adorable appearance. She stands just a bit shorter than Roll or Tron. Even though she doesn’t have any particular special skills, she’s very cheerful and positive. She usually acts a bit absent-minded, and her frequent (!) carelessness tends to stand out. There’s quite a bit she’s not very knowledgeable about. She often gets frustrated by the indecisiveness of _____. Her expectations towards _____ and the gang are far from reality. Once she witnessed the incredible mobility and speed of _____, she could feel the excitement welling up in her chest. She takes on the role of spotter for _____, but unlike Roll, she’s not very reliable. Her mistakes and carelessness invokes the fury of _____, but the other members always smooth things over. Lilly (if that winds up being her name) seems to be the air-headed cheerleader type for whatever this seemingly new group is. Her choice of personal pronoun may seem strange to those of us in English who for the most part use “I”, but in Japanese your choice of how you refer to yourself can say a lot about you. 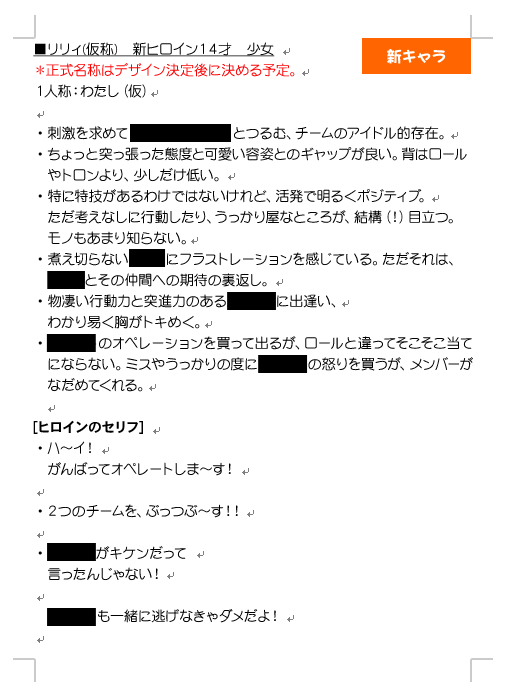 “Watashi” is fairly standard, not especially effeminate or tomboyish, and polite but not overly polite. This word choice might change depending on the style the character grows into. And now that we know a little bit about her, what do you think she should look like? 9 Comments to "Newest Legends Character: Lilly?" I’ve already voted for #2, though I think Sensei’s design is in the lead right now. They all look nice to me, but #2’s design caught my eye right away. Interestingly enough, I was having a hard time deciding between #2 and #6. Ultimately, I ended up voting for #6. I also really liked #5, as well. I ended up voting for #2, Hideki Ishikawa’s design. I like it because it’s very different from any other character so far, and since she doesn’t work in the field but rather as a Spotter like Roll, her dress isn’t so much a problem, and she looks kinda “idol-like”. She also comes across as someone who would have unreasonably high expectations for others but could maybe be a little airheaded. I’m a little disappointed she’s so far behind in the polls, but I like Sensei Haruki Suetsugu’s design too, so it’s not so bad. For the Japanese polling side, you have to leave a comment for the design you’re voting for. I like that, since a lot of people are rather torn or wish to mix and match elements from other designs, they can give that feedback as they’re voting. “This face on that dress!” I guess the US side has that too with the official thread, though. Albeit just a little less orderly. I’m a little disappointed they didn’t do that, but I supposed most of the time explanations for a choice might just be “I think it looks better” or something, though in the end I guess it all boils down to that. But I do wish there was a better way to talk about mixing features of the characters. I like Ishikawa’s but I think she could maybe look a little happier, for example. But im glad Sensei's doing good too. "Tomahawk Gal" and Higurashi's are my 2 top favorites. whichever one of them wins, ill be happy! And by the looks of it, Sensei's in the lead. Just wanted to add that my affiliate the Mega Man Network has an alternate translation up! That I guess they actually posted before mine. Foiled again! That’s okay though, always good to have a second opinion! All of these girls exept for 1 and 2 look like pilots or mechanics of some sort. 7 (my fave) even has wing-shaped hair!